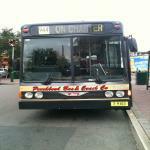 ATDB • View topic - New route 567 for Holmview. From 17 July 2017, new 567 will serving Holview Loops to Beenleigh train station from monday to Friday and Saturdays. Re: New route 567 for Holmview. Who is operating the service and with what bus? Article says it will be an 18 seater with wheelchair access. James00 wrote: with what bus? Article says it will be an 18 seater with wheelchair access. Maybe it's a Coaster with wheelchair lift ( ) like Transdev Melbourne has. A Coaster has 21 passenger seats. Add the wheelchair lift and it's 19 seats. The new ones don't have a front seat. Makes 18 seats. Last edited by Bus Suggestions on Fri Jun 16, 2017 8:04 pm, edited 1 time in total. You'd think that Clarks would be operating it,as it joins their contract area.But weirder things have happened.Guess some of our QLD friends will have to rock up on 17/7/17 to check it out. You'd also think it would be low floor,on an urban Translink contract..Maybe an Optare Solo downseated or one of the new Hino Ponchos . Whatever vehicle certaintly a first for Translink with a minibus. because Logan city bus is operating it. James00, has Clarks actually got one? Or is that PhotoShop? I think it's legit. It's on the front page of the TransLink site. Doesn't look like a photoshop unless it's a really good one. It's also got the Logan city logo above the door. The second photo is not the actual bus just an image from google. Should should be the first known sale of a Hino Poncho for route service in Australia. Be interesting to see how it performs in service. It's all legitimate. I'm one of the 3 drivers to run the new bus in. Ere haa !!! Ere haa!! I had a ride on this Hino HX Poncho today (same trip as Jonwil) and was quite impressed with it. It is nothing like the usual small buses, Toyota coasters or the ‘Pie carts’. It is wheel chair compliant, has good full head room and automatic transmission. The engine is at the back of the bus but the engine noise is very quiet. The ride was very smooth and no rattles at all. The route had some hilly bits and 80Klm sections but the Hino handled them easily. The customer service was excellent the friendly driver handing out timetables and Translink promoting the service too. I hope the route does well and the bus is a success. The drivers like it and the passengers liked the bus. It has 18 seats and a wide centre aisle. Thanks to Superbossgc for the post. I took some photos but as this is the discussion section I have posted them separately in the Photos Brisbane/Qld section. Thanks for the report.Sounds like a great little bus for low patronage services.There should be more on the road in my view.